Thanks to Baz for this reminder. I have a little problem. An itchy feet problem. And, with the beginning of 2015, I would like to announce my next trek. It’s interesting because actually I’d told myself I wouldn’t be doing this one. 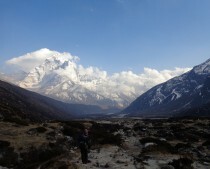 That the altitude is too high (5,896m), that the trek will be too difficult, that I would never survive it. And all of these may well yet be true. However, I cannot stop myself from going. I haven’t quite finished (or actually even really started) retelling my Peru trip to you, and for that I’m sorry. I’m getting there I promise. And with a new trip on the horizon, I really ought to get my skates on. The answer is, ‘I simply do not know’. I cannot describe to you the immense fatigue and exhaustion I put my body through. The mental trauma I insist on subjecting my brain to. The pain of having to rely and depend on other people to get me through. All of these upset my equilibrium to the core. And yet, there is something almost adrenaline junkie-esque about pushing your mind, body and soul to its extreme limits. I cannot tell myself no. I cannot ignore those thoughts in the back of my mind. I have to go. I have to at least try. Because somewhere in there, there is a reward so deep I just do not have the words to explain it to you. When I close my eyes, I am back. When the pictures pop up on my screen saver, it makes sense. When I’m languishing in the throes of my clockwork life, I remember it. When I dare myself to dream, I find peace. This time, like the first time, I am going to mix two of my loves together. Travel and (believe it or not) work. I will be raising money for VSO – Volunteer Services Overseas – which one day, I hope to go out with (once I’m all trained up and ready) and make a real difference in the best way I know how. This is my dream. There, I’ve said it. What better way to start 2015? A new goal to aim for. So without further ado, ladies and gentlemen – Mount Kilimanjaro – let’s be having you. So this never did take off the ground for various reasons including no leave. It’ll stay on my list until the right time.